A fundamental part of any feast is abundance that is shared, and for Nigella Lawson, who brought this recipe to The Times in 2004, one way is to make up little packages of cookies and give them as gifts. 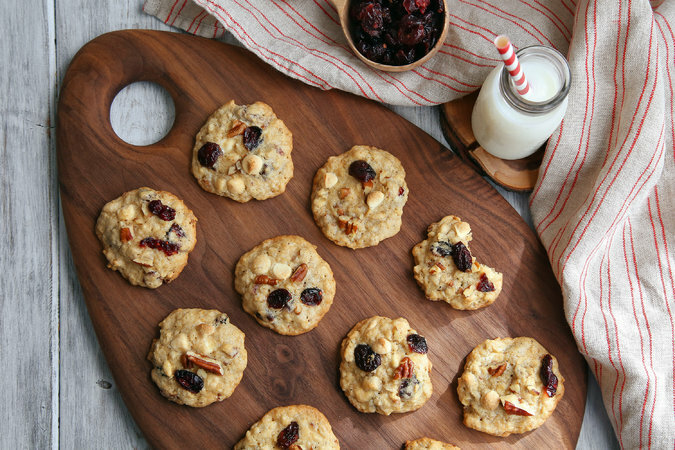 These cranberry and white chocolate cookies are a favorite. They are easy to make and a wonderful end to a meal, or an after-school indulgence. Don&apos;t overbake them. Heat oven to 350 degrees. In a mixing bowl, combine the flour, baking powder, salt and oats. In the bowl of an electric mixer, combine butter and sugars. Beat until smooth. Add egg and vanilla, and mix again. Line two baking sheets with a nonstick liner or parchment paper. Roll dough into balls (about 2 tablespoons per ball), and place them 1 1/2 inches apart on baking sheets. Press each ball gently with a fork to flatten it into a fat disk. Place sheets in oven on two racks. Bake just until cookies are pale gold, about 15 minutes; they will still be soft when hot. Cool cookies on sheet for 5 minutes, then cool on a wire rack.